An Anglo-Saxon pendant unearthed in 2017 near where a similar item worth £145,000 was dug up has been declared treasure by the coroner's office. The Winfarthing Pendant, valued at £145,000, was dug up on farmland in 2014 near Diss in Norfolk by a student. 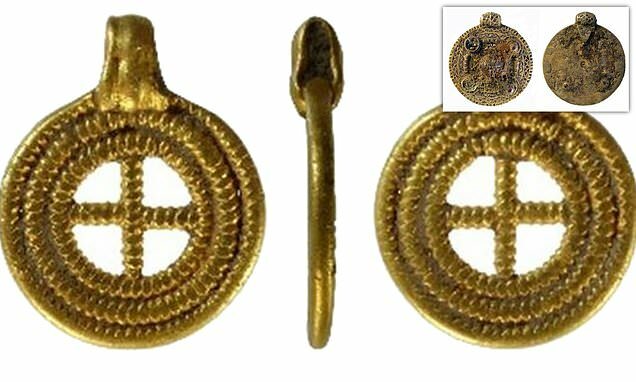 The gold piece has a central cross motif and probably belonged to a woman of 'high social status', according to experts. It features gold bead work and measures 17mm (0.67in) by 13mm (0.5in), and is believed to date from the late-6th Century to the mid-7th. It was declared treasure by the Norfolk coroner, which means that ownership now lies with the Crown. It will be valued by the Portable Antiquities Scheme run by the British Museum. Julie Shoemark, Norfolk's finds liaison officer, said it made a 'valuable contribution to our understanding of Saxon society'. Ms Shoemark, from Norfolk County Council's archaeology department, said: 'Like the Winfarthing assemblage, this piece most likely belonged to a high-status lady.